Cooked roasted turkey breast slices in butter and herbs. 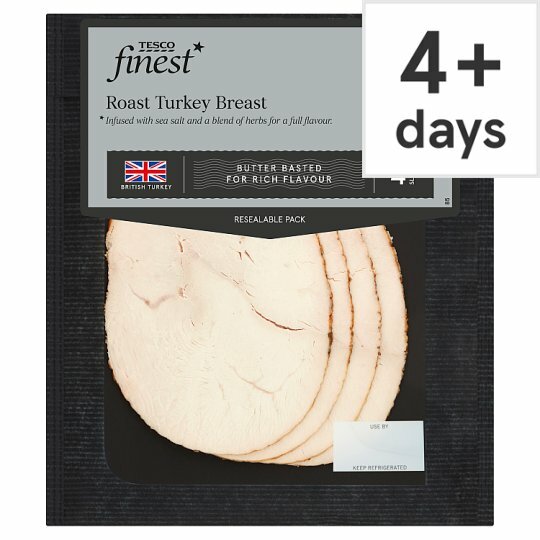 Tesco finest* Roast Turkey Breast 4 Slices Infused with sea salt, rosemary, thyme and sage. Basted with butter for a fuller flavour. Our Tesco Finest* cooked meats are made for us by a family owned business with a heritage of over 100 years, making premium quality products. Our 100% British turkey breasts are lightly seasoned with sea salt, rosemary, thyme and sage. They're then basted with butter for a mouthwatering flavour. INGREDIENTS: Turkey Breast, Butter (Milk) (2%), Sea Salt, Sage, Garlic Powder, Rosemary, Thyme, Black Pepper. Contains milk.For allergens, see ingredients in bold.